Please note this is an invite only event. 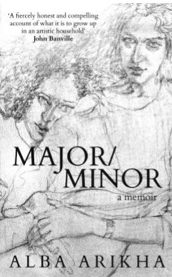 Alba Arikha has written a vivid and haunting coming-of-age memoir set in Paris in the 1980s. Her father was the artist, Avigdor Arikha; her mother the poet, Anne Atik; her godfather, Samuel Beckett. Their apartment/studio, where Alba and her sister grew up, was a hub of literary and artistic achievement, which still reverberates today. Alba’s tale is played out against the family memories of war and exile and the ever present echoes of the European holocaust. Time hangs somewhere between his words and the bustle around us. Between the sky above our heads and the untouched salad leaves on my father’s plate. Between what was then, and what is now. The man at the next table holding his white espresso cup. The Elvis Presley song. The town of Czernowitz in 1941. The violin and the stamp collection my father left behind. My teenage preoccupations. My great-uncle the pharmacist. The electric blue eye shadow I bought the other day, at the Monoprix supermarket make-up counter. I am aware of the disparity between my father’s memory and my reality. About adapting history to actuality. About keeping one’s balance without falling back into the trap of pain. Because that is, ultimately, what it’s about. The ability to let pain ease into endurance.